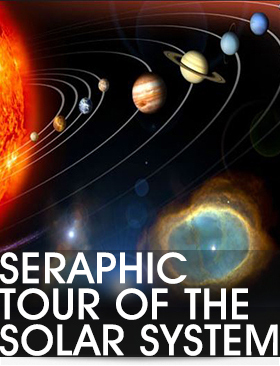 Seraphic Tour of the Solar System was born out of Seraphim Blueprint Level IV workshop entitled Cosmic Splendor. Here, we are initiated with energies called Planetary Washes. Our seafaring ancestors or our ancestors who lived off the land often spent much more time gazing into the night sky, receiving what Ruth Rendely channeled as “planetary vitamins” or high vibrational energy emanating from the planets in our solar system. After receiving the initiations in this workshop, the student has the ability to activate these energies from seven planets and our sun – for ourselves and others. According to the Seraph or High Angel, these energies are very beneficial for humanity. There is no pre-requisite to take this workshop.